How are you feeling today? I ask because my job is to comfort the afflicted, and to afflict the comfortable. So I need to know: which are you? Are you comfortable? Or afflicted? Could I get all you afflicted folks out there to raise your hand? OK, great. And now all you comfortable folks, raise your hand. Ah, it doesn’t work that way does it? Like me, you are afflicted with doubts and burdens. You seek comfort. And at the same time also, like me, you are also comfortable, knowing at some level that you need nudging to wake up, to transform, to embrace the challenge to become more than you have been yet exactly who you always have been. If it all seems a bit hackneyed, this is because so many films afterward copied that basic formula. Here we have the original. And life is like that. We are in this together: in a small conveyance in a desert landscape. The ride is bumpy, and we face great danger. The cast is ensemble – there is no star of the show, not even you. We are, all of us, supporting actors who must support each other if we are to make it through. Previous Westerns had been shoot-em-up melodrama with good guys in white hats and bad guys in black hats. But life is not like that. We are not divided into the black hats and the white hats. As the characters in Stagecoach, we come together flawed: we are women and men with a past – dark shames from which we are in quest of redemption. We come together afflicted by who we are, what we have done, our mistakes, our addictions, our failures of nerve and of character. We come together afflicted. I may not know what it is that’s afflicting you, but I know you are afflicted. I carry that awareness always, and my prayer is that I will be able to show you that I do in such a way that you can see it. And we, on this stagecoach of life together, recognizing our human affliction, comfort each other. Yes, we sometimes snipe at each other – because, after all, we’re not all that comfortable (it is hot and dusty and bumpy) and we have a lot of anxiety. There’s Apaches out there, and we’ve done them wrong. Out of our own affliction and complacency, we have committed injustices; we are complicit in grave wrong, and the wronged are sore about it, and they’re coming to get us. Yet we lend to each other the gifts and skills we have, and in that shared ride, commit ourselves to something grander than ourselves. Perhaps, thereby, redemption is found, and perhaps not. Fundamental ambiguities remain. The religious journey, the pilgrimage, takes us away from home in the hope that we will thereby be led to a truer home. The journey is dangerous -- it places us at risk of losing what we have been. And on the journey, we will be both afflicted and comforted. Blessings to you on your journey. 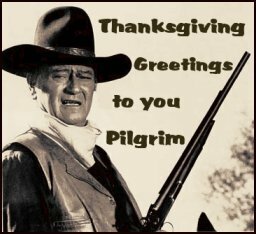 And, as John Wayne himself said, "Take 'er easy there, Pilgrim." This is part 1 of 2 of "Stagecoach"
Next: Part 2: "Stagecoach II"
Gee Meredith, I'm glad you are journeying at the same time I am and reporting as you go. It makes my journey easier and more pleasant.